CS2N Groups have recently received a major update! One of key features of CS-STEM Network is CS2N Groups, an online classroom for anyone to take advantage of all CS-STEM materials and integrate them into their programs. Whether it's for your school, club, homeschool, or self-learning, CS2N Groups is your way to help keep track of progress! If you have used CS2N Groups before, you will notice a new look! Featuring a cleaner, and compact experience. This is just one of the many new changes to CS2N Groups. Every user on CS2N has the ability to host up to 3 CS2N Groups, with 30 users per group. We are proud of how a simple idea on pen and paper turned into such a huge tool for many teachers across the world. If you do wish to continue using CS2N Groups without limitations, we do want to take this time and ask for your support by considering a premium subscription. Generate CS2N accounts for users via a roster spreadsheet. Students no longer need an email address! Certify your students! 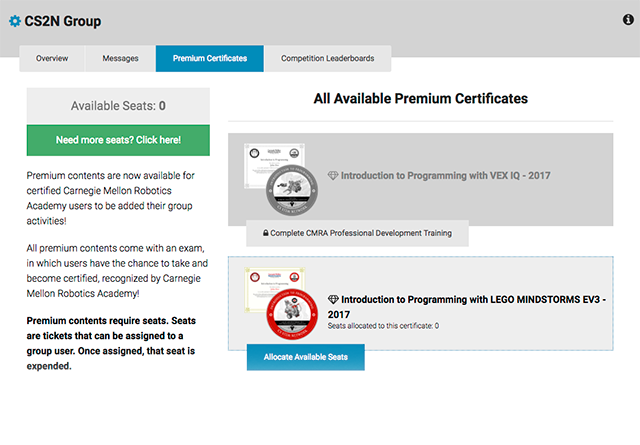 CMRA Certified Teachers can now certify their students with Certification Exams for their respective platforms, including LEGO MINDSTORMS EV3, VEX IQ, and VEX EDR! Granting certification access to students requires purchasing a registration, which can be easily allocated in the Exam Registrations in your groups, then assigned to the student in the Overview. 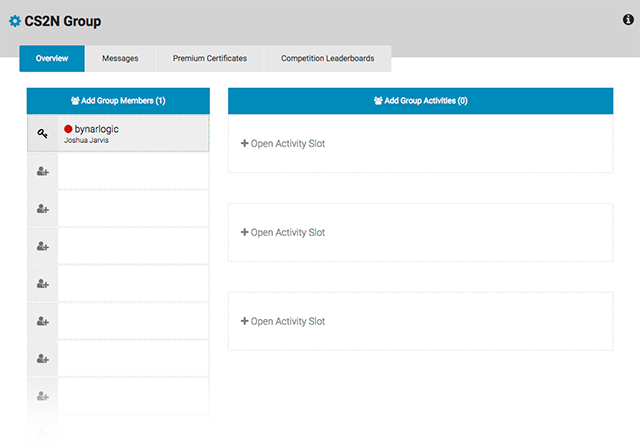 All CS2N activities added within CS2N Groups now come with a Progress Table. 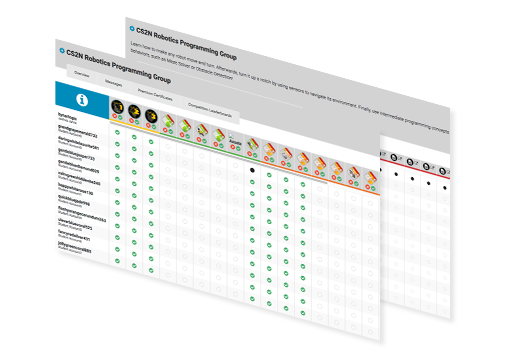 This table allows users to see their and other group members' progress on CS2N activities! 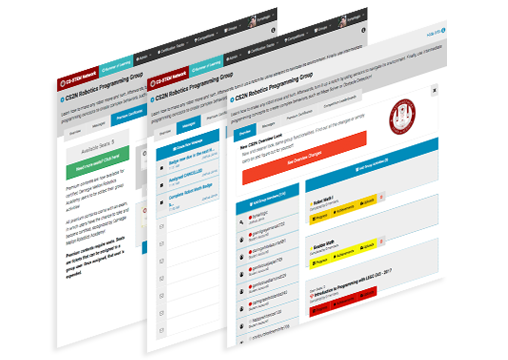 Tracked progress includes content/material pages, CS2N games and RVW activities, quizzes and exams scores and more! Teachers can even export the data into a spreadsheet format. Other tables include controlling the CS2N system of granting and revoking achievements, and viewing and downloading all uploads made by group users!